About a year ago I set out to cook every recipe in The Happy Kitchen/La Cocina Alegre™ cookbook Fresh, Seasonal Recipes and blog about my experiences. I thought it sounded like a fun project, a good chance to try some of the recipes that I hadn’t made before and hopefully a way to make it a little easier to decide what to have for dinner each night. Click here to read more about Katy's year of cooking and blogging! October is a busy time for local food systems advocates and programs. Not only does Food Day fall on the 24th, but the whole month is dedicated to Farm to School activities. With events and activities occurring all over the country, National Farm to School Month provides Austin-area schools participating in SFC’s Sprouting Health Kids program an opportunity to shine a nationwide spotlight on efforts to connect students with healthy, local food. Click here to read more about National Farm to School month! We’ve had a terrific season of Citizen Gardener classes this fall! 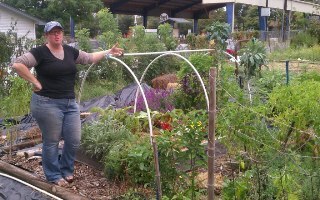 Citizen Gardener participants learned how to start their own food gardens while helping to establish or enhance gardens at Gateway Church, UT Elementary, Alamo Community Garden, and East Communities YMCA. Participants learned to build their own raised garden bed, a rainwater catchment system, and a successful compost pile, along with a wealth of other gardening wisdom. Click here to read more about how you can get involved with Citizen Gardener! Our 5th Annual Volunteer Appreciation went off without a hitch. 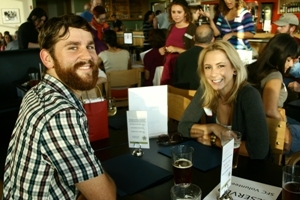 Over Black Star Co-op appetizers, beer and wine, 200 volunteers mixed, mingled, and were showered with “thank yous”. While we appreciate all you volunteers everyday, week, and month, we try to show just how much with this annual event. Click here to read more about our wonderful volunteer appreciation event! 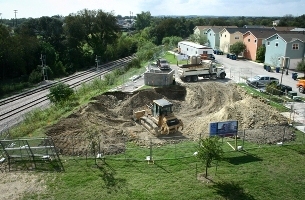 Join us as Texas Gas Service presents Jesse Griffith’s Chef Demo and Book-Signing. 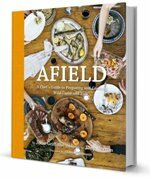 Be the first to get Jesse’s new book- Afield: A Chef's Guide to Cooking and Preparing Wild Game and Fish. Visit his Facebook page, Like it and leave a comment telling us your favorite kind of wild game and you’ll be entered for the chance to win a free signed copy of Afield. Be sure to stop by the Texas Gas Service tent to enter the raffle to win a new grill from Barbeques Galore. A portion of the book proceeds will benefit SFC. So come support your local community and buy Jesse’s book! It’s your chance to participate in the local food policy process: join the Austin/Travis County Sustainable Food Policy Board for a community meeting on Monday, October 22nd from 6pm to 8 pm at The Millennium Youth Entertainment Complex, 1156 Hargrave Street. The founders of Ecopocalypse invite you to Día de los Muertos: A gala to benefit Sustainable Food Center on October 18th! For more information and to purchase tickets, please click here. SFC subscribers receive 20% off their purchase. Enter discount code 1018sfc at checkout. Oct. 28th, 6:30-9:30pm. Costumes encouraged! Live performance of “Thriller!” Tickets here. Learn more about how YOU can be involved in providing care for thousands of people; it’s as fun and easy as riding a bike! Check out the Mamma Jamma on Facebook and the Mamma Jamma Ride website - please join US for this year’s Ride. Travaasa presents a fundraiser for SFC on Nov. 11 featuring Chef Josh Watkins of The Carillon, Ben Baker of Travaasa, Tim Dorman of Uchiko, Erica Beneke of Max's Wine Dive and John Bates of Noble Pig. Tickets on sale here!